Bead Blaster from Dillon Floyd Weitl on Vimeo. 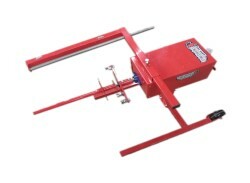 This is for a Bead Blaster Pneumatic Bead Breaker by Performance Ag and Tool. The Bead Blaster is just that it blasts those hard to dismount tires loose! Breaking the bead on racing tires can be a real challenge and tire machines struggle with the soft sidewalls. Not the bead blaster! It makes short work of breaking the bead off stubborn tires and breaks that bead in seconds with no effort. 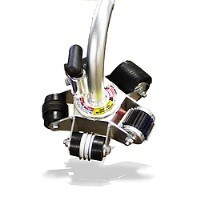 It is totally portable and air operated which makes it easy to use at the racetrack when breaking down tires. It also works on most steel wheels, farm tires, ATV, and even mower tires, all you need is an air hose and the Bead Blaster and your tire dismounting problems are over!